More than 3 million registered voters in the state have no party affiliation and more than 4 million unregistered Floridians eligible to vote. With 29 electoral votes, Florida is considered the biggest prize among swing states. 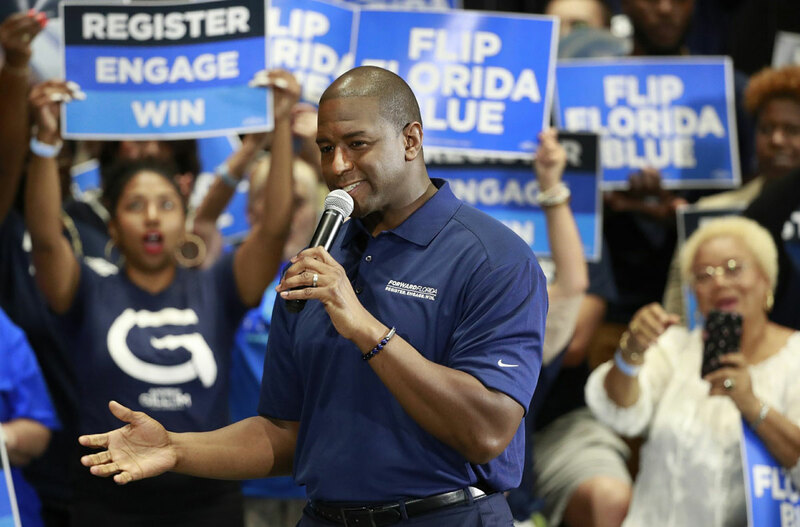 Former Florida Democratic gubernatorial candidate Andrew Gillum wants to register at least 1 million voters in an effort to make the state swing blue in the 2020 presidential race. Earlier, the Florida Democratic Party announced a plan to spend $2 million with a goal of signing up 200,000 Floridians to vote. In 2017, the party said it registered only about 80,000 new voters. Gillum balked at the conservative lawmakers’ efforts Wednesday evening. “I want us to send an unapologetic message to our legislature to get their hands off our Amendment 4,” Gillum said. Marlo Joseph, a security guard working the event, stood at the far end of the gymnasium, watching over the door as Gillum spoke. The 43-year-old from Miami’s impoverished Liberty City neighborhood said she is not a registered voter. Although she would not describe herself as a political person, she said her opinion of President Trump and the Republicans soured after the recent government shutdown. She has family members who work for the TSA who endured weeks without pay. After hearing Gillum speak, she said has decided to register to vote.